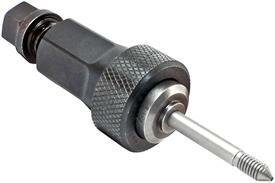 Blind Nut / Blind Bolt modular hand installation tool. Hand tool expense can be reduced significantly using our modular system compared to single purpose tools that are currently available on the market. This versatile tool allows for the interchange of anvils and mandrels permitting one base tool to install all fasteners within the capability of the tool. This avoids the expense of purchasing unique tool assemblies for every fastener style or diameter.